The pace of my options activity hasn't slowed down a bit thus far in 2016. Although I do expect things to finally slow down as I transition back to work and also try and figure out a better way to close my winning positions. I'm a big fan of closing them once they reach the 50% of max profit level although as we get closer to expiration I think it's probably best to take a bit more risk and aim for higher profit targets if they are well out of the money. Without further ado let's get into the options moves. We'll start with the position closes first and then move on to the new positions. I've had Smucker on my radar for a while now, but the share price always seems to elude me. Towards the end of 2016 the share price had declined a bit, but still not to where I was wanting to buy shares. However, that did open up the opportunity to write a put option and get paid if the share price climbed higher. The net profit on the Smucker put worked out to $74.91. Based on the $12,000 of capital "at risk" that's a 0.62% return. Since the return was earned in about 20 days that's a 12.04% annualized return. 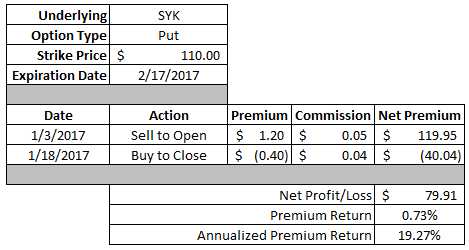 Over the last couple months I continued to utilize Stryker as an option vehicle. Whether it's the change in government and potential repeal of "Obamacare" or just perceived risk in the healthcare sector right now the options premium has been wonderful to collect. In fact, counting this put option I've been able to open and close 3 different put options and collect a total premium of nearly $230. This put option generated a total profit of $79.91 which is a 0.73% return based on the $11,000 of capital used to secure the option. When accounting for the time that the profit was generated in that's a 19.27% annualized return. Visa is another company that I've repeatedly sold put options on over the past few months. In my Rollover IRA I've now opened and closed 4 different put options generating a total premium of nearly $415. This particular put option on Visa worked out wonderfully. Back in November Visa's share price took a couple of big dips that I couldn't find an explanation for so I took advantage of the opportunities by selling put options. Unfortunately Visa's share price won't get back down to the mid to low $70's where put options would be a lot more attractive. The total profit on this option worked out to $167.91. On the $7,250 in cash required to secure the put option that's a solid 2.32% return. On an annualized basis that's a 13.29% annual rate. I was able to capture over 80% of the maximum profit in just over 50% of the days to expiration which is a big win in my book. No that's not a typo. I told you that I've liked using Visa as an alternative income source via option premium. Although this put option was a bit of a mistake when I opened it. You see when I went to put in my order to sell the contract I had forgotten to swap it over to my Rollover IRA where I have lots of cash on the sidelines. Of course it got filled almost immediately in the account that I didn't want. So I wanted to be a bit more aggressive with closing this put option and took a smaller profit in order to close the position. Luckily things still worked out nicely as Visa's share price had a little bump higher and the time decay started eating away at the price of the contract. I was able to generate a $31.01 profit on this trade which is a 0.39% return based on the $8,000 of cash potentially "at risk". That's a 22.37% annualized return. The return was actually higher since it was used in my margin account so the full cash wasn't needed. Based on the margin requirements, ~$2,050, the returns jump to 1.51% and 118.89%. I didn't even get a chance to write about opening this put option before I was already closing it. But if the market offers you a good opportunity you take it. I originally opened this put option last Wednesday as a bit of an earnings play with the idea that Union Pacific would announce good earnings and the share price would move higher. Luckily my plan is exactly what happened. Trust me it doesn't always work like that. I hope that we see some weakness in Union Pacific over the coming weeks to give me some opportunities to write some more put options. I was able to lock in a profit of $67.91 on this put option. Based on the $9,700 in cash to secure the contract that's a 0.70% return. The annualized return is sky high since the contract was only open across 3 days and came in at 257.55%. I was tempted to try and squeeze a bit more juice out of this one, but decided to close it since I was able to capture almost 60% of the option premium in just 5% of the days to expiration. I don't typically sell call options on the shares I own, especially in my taxable account but this particular one worked out nicely. That's more than I can say about my previous call options on Target that I'm still battling to turn a profit on. More on that later. In isolation this call option produced a $28.20 profit. That worked out to a 0.37% return or 6.65% on an annualized basis. Unfortunately, this call wasn't done in isolation and is part of my fight to turn a profit on a previous call option gone bad. Back in mid-October I sold a call option on Target expiring in November. 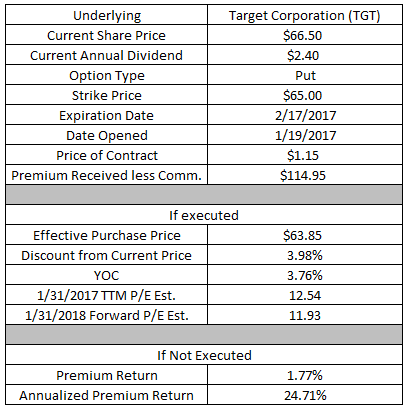 Target announced earnings about 1 week before the expiration date and the share price jumped 7-8% and well past my strike price. That forced me into the decision of letting the shares get called away, while leaving money on the table, or rolling the call. I chose to roll the call up and out to April and then in late December I was able to roll the call back down and in to this contract that just expired. I'm still sitting at a $77.28 loss from the original call option that I had written back in October. So there's work to do in order to turn a profit or I can just take the loss and write it off come tax time. With the current price now below $64 I don't think there will be much of an opportunity to sell more calls until the share price recovers to at least $70 or I should have just let them get called away back in November. So for now I'll just sit and wait for other opportunities. Lowe's is a company I've revisited a couple of times already and last week I went back to that well yet again. If Lowe's share price falls below $68.50 then I'll have to purchase 100 shares at the strike price. However, since I received the premium payment my purchase price would be reduced by $86.95 reducing the purchase price to $67.63 per share. That's about a 5.25% discount from the price that Lowe's was trading at when the contract was opened. The valuation at that purchase price looks pretty solid. Lowe's fiscal year ends at the end of January so both P/E ratios are on a forward looking basis. Based on the current fiscal year the valuation would be 17.2x and looking forward to the next fiscal year the forward valuation would be 14.9x. The yield on cost at that purchase price would be 2.07% based on the current quarterly payout. 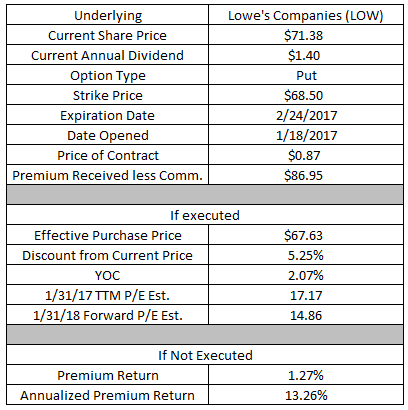 If Lowe's remains above $68.50 then I'll just keep the option premium as profit. Based on the $6,850 of cash required to secure the put option that's a 1.27% return. On an annualized basis that works out to a 13.3% return. 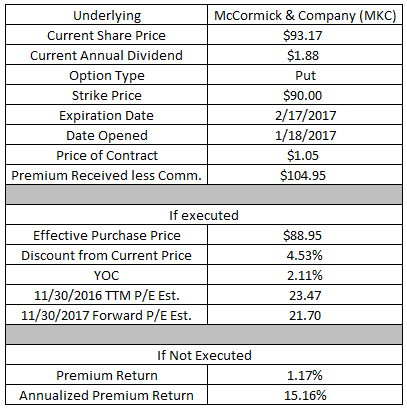 McCormick is one of those pesky consumer staples companies that always seems to be trading at a premium valuation. I've come to the realization that it's one of those companies you have to settle for an okay valuation in good market times and will only truly be able to pick up shares at a discount when the entire market is heading down. If McCormick's share price falls below $90 then I'll likely have to purchase 100 shares for $90 a piece. Since I received the option premium of $104.95 that will reduce my effective purchase price to $88.95 which is approximately a 4.5% discount from the price McCormick is currently trading at. McCormick's fiscal year ends at the end of November; however, they've yet to announce 4Q and full year results for the prior year. So both the trailing and forward valuations are based off the average analyst estimate. On a trailing basis the valuation would be 23.5x and on a forward basis the valuation would be 21.7x. The yield on cost based on the current quarterly payout would be 2.11%. If McCormick's share price remains above $90 then I'll keep the $88.95 option premium as profit. Based on the $9,000 required to secure the put option that's a 1.17% return or 15.2% on an annualized basis. Target's share price has been all over the place over the last couple of months. Back in October it was around $70. By mid November it had a one day jump up to $77/78 and last week it dropped from about $72 to $66. Talk about some volatility. If Target's share price falls below $65 then I'll have to purchase 100 shares for $65 per share. Since I've received the option premium already, my purchase price would be reduced by $114.95 lowering the per share cost basis to $63.85. That's around a 4.0% discount from where shares were trading when I opened the contract. Target's fiscal years end at the end of January so both valuations are technically on a forward basis. For the current fiscal year ending 1/31/2017 the valuation if I'm assigned the shares would be 12.5x. Looking forward to 1/31/2018 the valuation would be 11.9x. At that purchase price these shares would have a yield on cost of 3.76%. If the share price stays above $65 then the $114.95 option premium will turn into pure profit. Based on the $6,500 in cash necessary to secure the contract that would represent a 1.77%. On an annualized basis that works out to a 24.7% return. My thought process behind selling this put option hinged largely around the idea that Target's share price would stabilize and possibly drift higher over the coming days. Target's share price had made a dramatic move lower earlier in the week. Unfortunately the share price has continued lower and I've lost out on a lot of extra premium that I could have received for this contract. 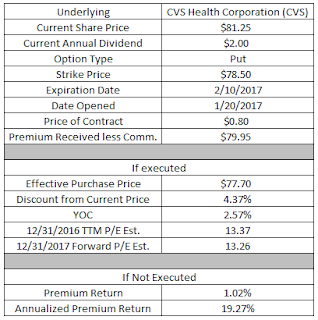 I've been eyeing adding CVS to my portfolio and really missed a great opportunity when it dipped down to the low $70's a few months back. But it was an opportunity missed and we have to deal with where things are now. Although the current price still represents a pretty good buy in my opinion, but a purchase in the $70's would be even better. 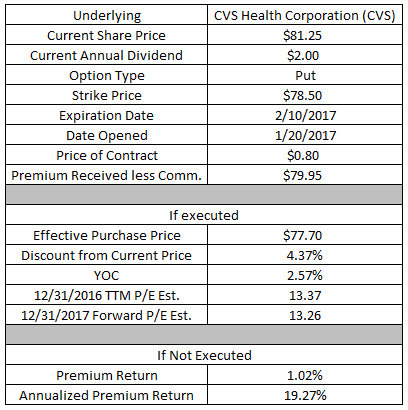 If CVS' share price falls below $78.50 then I'll have to purchase 100 shares for the strike price less the premium I've already received of $79.95. That puts my effective purchase price at $77.70. That's around a 4.4% discount to the current share price. CVS has yet to announce 4Q and full year 2016 earnings although the fiscal year is currently complete. Based on fiscal year 2016's estimates the purchase price would have a 13.4x P/E. Looking forward to 2017's estimates the valuation would be at 13.3x. At the current annual dividend rate of $2.00 the position would carry a yield on cost of 2.57%. If CVS' share price remains above $78.50 then I'll get to keep the full premium as profit. The $79.95 option premium would represent a 1.02% return based on the $7,850 in capital to secure the contract. On an annualized basis that's a 19.3% return. Thus far in January I've been able to generate $1,090.89 in profit via closed/expired options. It's obviously early into 2017, but in less than 1 month I've already collected more total premium than I did across the last 4 months of 2016. I have 2 other moves from last week that I'll be reporting on later this week. One is a new buy/write position and the other is a put option that finished in the money and the shares were put to me. I've actually converted the 2nd one into a covered strangle since I'm fine adding more shares to my portfolio and if it gets called away the return looks nice. However, it's late and since those will need a bit more explanation than normal I'm off to spend time with my wife and daughter. 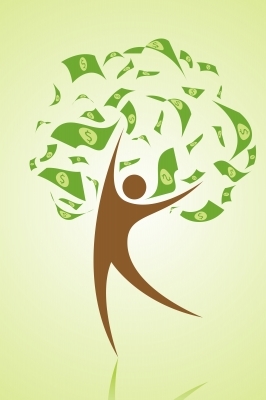 Do you only rely on dividends to generate investment income or do you utilize options to boost up the gains as well? These all look like tasty trades. I rarely close my short options early. Too much work! Thank you for sharing. Since you seem to have a bunch of good options, maybe you should forget about making that loser a winner and focus on your winners. Anyways, thank you for this update. Fantastic job and the month isn't over. Thanks for sharing.